If you’re into birding then you’ll love Mkhuze Game Reserve – its home to some 400-odd different species which have flourished in the park’s swamps and woodlands. For bigger mammal lovers like myself, the park has four of the Big Five (no lion) as well as nyala, wildebeest, warthog, impala, kudu and other smaller antelope. The park also offers rare sightings of hyena – heard but sadly not seen in my experience. Birders should make sure they take a stroll through the Fig Forest which provides numerous bird and monkey sightings, while the three hides offer excellent viewing of the larger mammals. At Nsumo Pan Hide I easily spied hippo and crocodiles and at Kumahloha hide I was amazed by the constant parade of wildlife coming down to the pan including rhino, giraffe, kudu, wildebeest, zebra and baboons. Mkhuze features the usual acacia savannah, but as it lies just to the northwest of the iSimangaliso Wetland Park, it also features tropical swamps and well-watered riverine forest. The roads were easy to navigate, but some passed through areas of thick bush, which were not ideal for game viewing. The grasslands, however, were more open, where we found giraffe, wildebeest, kudu and nyala, and at the airstrip we were lucky to see cheetah (they love the flatness of airstrips). Although I did see rhino, they aren’t as prolific as in Hluhluwe-Imfolozi. At the pans, we were able to get out of the car and walk down to some hides to watch the many aquatic birds. Mkuze’s appeal is its location; easily accessed off the N2 highway and not far from the coast, offering a good combination of safari options with the other Maputaland reserves. The best thing about Mkhuze Game Reserve are the hides. As a photographer, I can sit in one of these perfectly designed hides all day. Kumasinga hide in particular tends to be very rewarding. The water surrounds the hide, so animals can approach from any direction. In fact, at times, you are literally surrounded by animals while sitting inside. There is usually a constant stream of animals coming to drink. Nyala, impala and warthogs are almost a constant presence. 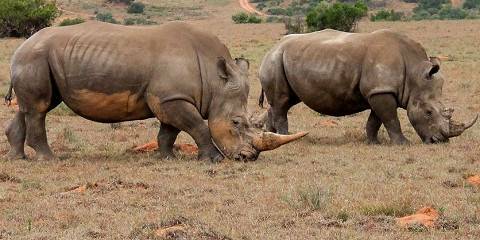 Rhinos often come alone or in small groups and a herd of elephants can take over the whole waterhole. Often there is a variety of animals at the waterhole at the same time. Some animals, like zebra and wildebeest, like to wade into the water and come really close to the hide so you could almost touch them. 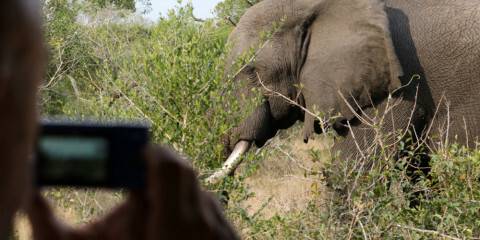 If you’re really lucky and you keep quiet, you might also see wild dogs or even a leopard. The hides are big, which makes moving around and photographing from different angles easy, but it also means that you sometimes share the hide with lots of other people. Therefore, South African school holidays aren’t a great time for visiting this small park as it can be very frustrating in the hides especially. 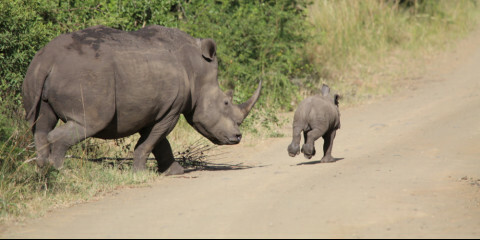 Although it was recently incorporated as the 40 000 hectare uMkhuze Section of the iSimangaliso Wetland World Heritage Site, Mkuze is one of Africa's oldest game reserves. With Sand Forest giving way to gently undulating grasslands, peppered with flat-top acacias and fever tree-choked drainage lines, the park is well-known amongst ornithologists for its varied habitat and rich birdlife. Twitchers tend to concentrate their energies on Nsumo Pan and the neighbouring fig tree forests, while wildlife enthusiasts focus their energies on Kumasinga Hide: the most productive of Mkuze's four recently refurbished game-viewing hides. Despite ongoing problems with poaching, Mkuze still boasts excellent densities of most antelope species. The reserve is also home to rhino, leopard, cheetah and wild dog and a programme to reintroduce lions has just been approved, so it won't be too long before the final member of the Big 5 makes a welcome reappearance in Mkuze Game Reserve. What most distinguishes this small Zululand reserve is its network of about five photographic hides overlooking waterholes that seasonally attract incredible numbers of game. It is an exceptional spot for close up views and photographs of white rhino – we counted about a dozen in one day – as well as an ongoing parade of impala, warthog, zebra and Chacma baboon. The striking nyala antelope is common and the male is likely to be seen performing its spectacular dominance display’, erecting its long white spinal crest in a bristling assertively. More occasional drinkers include elephant, black rhino, giraffe and leopard, while regular avian visitors include the crested and crowned guineafowl and the garish purple-crested turaco. On a moderately busy day you might easily shoot 500-1,000 frames at the hide, but it also worth heading to Nsumo Pan, I the south of the park, where hippos grunt in shallows enclosed by a margin of tall yellow fever trees. The allure of Mkhuze always calls me back. Though very small by African standards, this gem of a park has a special ambience and – whether an aardvark in the headlights or a python on the trail – often springs surprises. Sandwiched between the aloe-studded Lebombo Mountains and the St Lucia Wetland complex, its picturesque savanna woodland supports a wide selection of herbivores, including both rhino species and numerous nyala. A small elephant population has been introduced, and I have seen leopard here both by night and day. Visitor a can enjoy guided day walks, night drives, self-guided trails and picnic sites – although the place never seems crowded. Best are the excellent viewing hides, each overlooking a different waterhole in its own distinct habitat. Photographers love these, and I have spent entire days watching the wildlife traffic coming and going. Other highlights include Nsumo Pan, teeming with hippos and crocodiles, and the fig forest trail, which winds among giant riverine trees. The birding is outstanding – arguably the best in South Africa – with such local specials as African broadbill and pink-throated twinspot among an astonishing 420 recorded species.